Microsoft's chief executive yesterday touted a new number for Windows 10, saying the operating system now powers 500 million devices -- half way toward a goal the company once gave itself but since discarded. During a keynote address that opened Microsoft's Build developers conference in Seattle Wednesday, CEO Satya Nadella updated the Windows 10 installed base as he pitched the OS to programmers. "Think about the 500 million Windows 10 devices that you can now reach through the Windows Store," Nadella said. "That reach is what's going to drive our ecosystem going forward. It's going to give each one of you more of an audience, more users, more engagement in a secure way." Nadella's talk of 500 million was the first change to Microsoft's official Windows 10 milestone since September 2016, when the company claimed 400 million "active devices." Microsoft's claim was significantly higher than Computerworld's latest calculation, which was based on metrics vendor Net Applications' measurement of Windows 10's user share and Microsoft's oft-cited contention that 1.5 billion machines run Windows. At the end of April, Windows 10's share of all Windows stood at 28.7%, which represented approximately 430 million systems. But Net Applications' tallies include only personal computers, while Microsoft's count also covers Xbox consoles, tablets and a small number of Windows-powered smartphones. The 500 million would have been the midway point toward the 1 billion Windows 10 devices that in 2015 Microsoft set as a July 2018 goal. But last year, the company conceded that the objective was unreachable under the self-imposed time limit. "It will take longer than FY18 for us to reach our goal of 1 billion monthly active devices," a spokesperson acknowledged in July 2016. Microsoft's fiscal year 2018 -- the "FY18" mentioned in the statement -- ends June 1, 2018. Microsoft blamed the scrapping of the 1 billion target on the failure of its smartphone strategy, which never met sales expectations and ultimately cost the company billions as it first wrote off the acquisition of Nokia, then wound down its mobile hardware business. Windows 10 grew by 24% since Microsoft ended the free upgrade offer last year, but the staying power of Windows 7 -- that edition still powered more than half of all Windows PCs in April -- hinted that enterprises have yet to migrate to the newer OS in large numbers. Windows 7 falls off Microsoft's support list in January 2020. 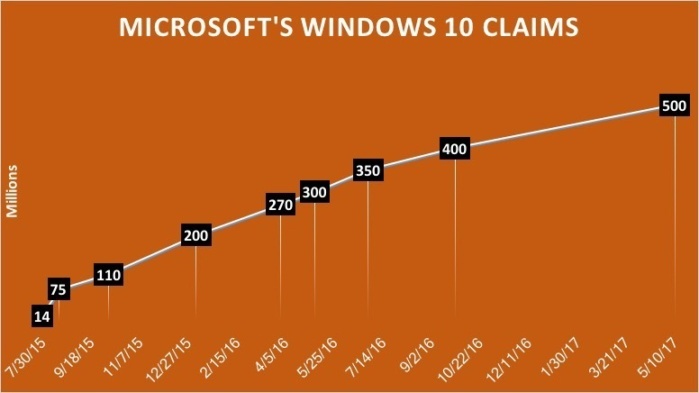 Microsoft upped its claim of Windows 10 devices to 500 million Wednesday, the first milestone refresh from the company more than seven months.